"The wealthy and mighty czar Aggei, ruler of a great country, grew proud and haughty. One day, hearing the priest read from the Holy Scriptures that the rich may become poor and the poor rich, he became angry. Was it possible that he, Aggei, could ever become poor, and some beggar become rich in his stead? He ordered the priest to be imprisoned and the leaves containing the words he had expounded to be torn from the book. God thereupon resolved to humiliate Aggei for his arrogance. On one occasion, when hunting with his servants, he started a beautiful deer, which he pursued into a lonely place, far away from his retainers. When the deer took to the river, Aggei swam after it and followed it into a forest. The creature was an angel that had taken the form of a deer. Later, by the Lord's command, it assumed the appearance of Aggei, joined the hunters, and rode home with them. No one suspected that he was not the real czar, though all were surprised at the change in his behavior; for he became serious and meted out justice on every hand. "The real Aggei, naked, hungry, and exhausted, met a shepherd, to whom he declared himself as the sovereign. The shepherd considered him an impostor and gave him a thrashing; but later, deciding that Aggei was insane, he threw a sheepskin about him to cover his nakedness. When Aggei returned to the city he went to the palace, but the guard drove him away. He then had to work as a common laborer. Convinced that a bold and impudent impostor had usurped his place, Aggei repaired to the church and, when the new ruler passed by, looked into his face and immediately recognized the angel of the Lord. Filled with horror and fear, he left the city, and soon became convinced that God had punished him for his haughtiness. In his humiliation he confessed his sins and prayed to God for mercy and strength. At the end of three years the new sovereign issued an order commanding all the beggars and the poor throughout the country to attend a grand reception and feast in his palace. Among them was a group of blind men, with Aggei as their leader. When the angel passed round, he asked Aggei: 'Are you also a beggar?' Aggei replied that he was but the servant of the beggars. The angel then told him that his punishment was at an end and that he might take the ruler's mantle, the sword, and the scepter again, and rule the people wisely and mildly. But Aggei did not wish to rule again; and he went away to lead the blind." This legend is based upon the haggadic tales of Solomon (Sanh. 95a; Cant. R. to i. 10; Targ. Eccl. i. 12; Midr. Tan., Waera; Yer. Sanh. ii. 20; Giṭ. 68b; see especially the old Russian legend of the "Czar Solomon and Kitovras" (that is, Asmodeus), which is to be found in the collection of legends on Biblical topics under the title "Paleya" (1477 and 1494), which are almost exactly the same in contents as the Talmudic Haggadah of "King Solomon and Asmodeus"). S. Beilin is of opinion that the Russians received the Talmudic legend in a Russian rendering from South Russian Jews in very early times ("Skazanie o Gordom Aggeye" (Tale of the Proud Aggei) in "Voskhod," November, 1899). Israel Lévi in his article, "L'Orgueil de Salomon" ("Rev. Ét. Juives," xvii. 58 et seq. ), also tries to prove that the legend is not of Indian, but of Jewish, origin; while M. Vesselovski, in "Neue Beiträge zur Geschichte der Salomonsage" ("Archiv für Slavische Philologie," 1882, pp. 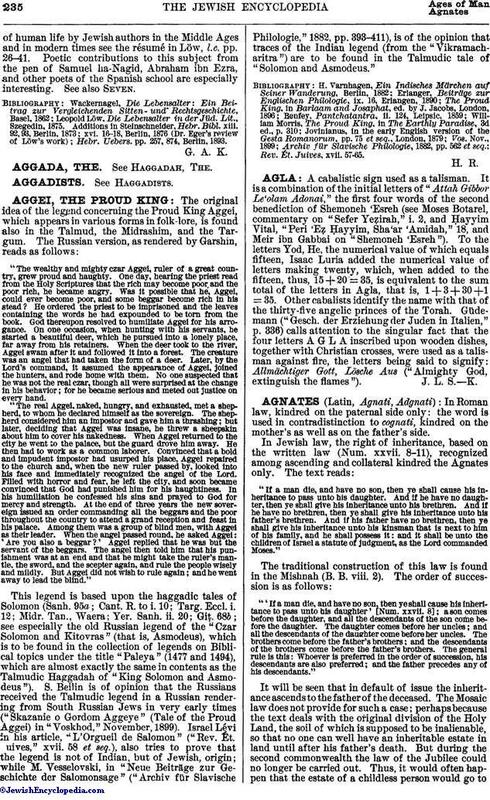 393-411), is of the opinion that traces of the Indian legend (from the "Vikramacharitra") are to be found in the Talmudic tale of "Solomon and Asmodeus." Rev. Ét. Juives, xvii. 57-65.